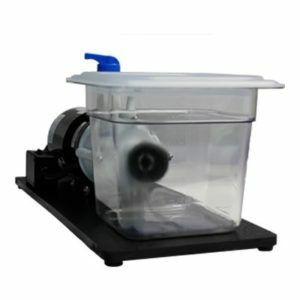 The Ion Clean Machine has been developed to improve the current cleaning methods of water ionizer machines. This is achieved by pressurizing the cleaning solutions and having it circulate through the machine causing the cleaning solution to work more efficiently and reduce cleaning time. This machine was constructed using a Budwig Molded rubber bumper feet, Part # SF6T-TPR87-B. Also, various anti-corrosion materials such as polypropylene, ceramic, and stainless steel, these units feature leak-proof, seal-less magnetic drives and are designed for in-line, non-submersed use. Thermally protected open fan-cooled motor with ball bearings. 6 ft. power cord and 3-prong molded plug. Attached is a tank with a splash cover. Clean like a professional!